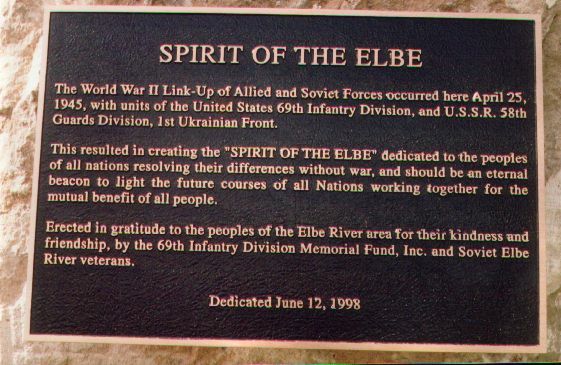 Spirit of the Elbe bronze plaque in English. It is with great pleasure the U. S. Department of State Bureau of Russian Affairs announces it will be sending representatives to join the Russian Ambassador to the U.S. at Arlington Cemetery, April 25, 2008, 10:00 AM to lay a wreath for the 63rd Anniversary of the meeting of U.S. and Soviet troops at the Elbe River, April 25, 1945 to continue "The Spirit of the Elbe". Ms. Daphne Zoe Stavropolous, Senior Bilateral Officer, Bureau of European and Eurasian Affairs, U.S. Department of State, cordially invites all members of the 69th Infantry Division and its Attached Units and other veterans who live in the Washington and nearby area to attend the ceremony. Family members are also invited. The wreath laying ceremony is taking place under the direction of the Cultural Affairs Department, Russian Embassy, Ms. Maria Temyashova, telephone (202) 298 5701, e-mail mtemyashova@mail.ru or fax (202) 298-5751. 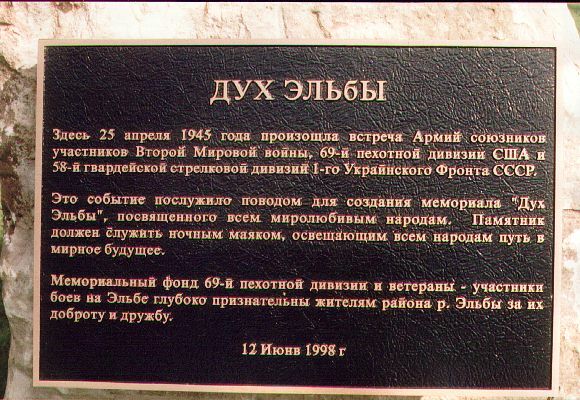 She expects ambassadors and diplomats from countries of the former Soviet Unionand reporters to be at the wreath laying. If you drive a car to the Embassy, it may be parked inside the Embassy premises. Here again, to park your car, provide your car/make/colors/tag number/state to Ms Temyashova at least 48 hours prior to the event. Or, you may be at the Arlington gate at 9:30 AM and ask the guards for directions to the Russian Embassy wreath laying. When you arrive at either location, make it known you were a member of the 69th Infantry Division, or the Attached Unit, that met the Russians at the Elbe River, April 25,1945. If you have a Reunion name tag or 69th cap wear them. After the ceremony, the bus will bring everybody back to the to the Embassy for refreshments and snacks served to commemorate the Link-Up and Victory Day. The Spirit of the Elbe continues!